I read this article and found it very interesting, thought it might be something for you. The article is called Top 12 Corporate NPAs Cost Exchequer Twice As Much As Farm Loan Waivers https://www.indiaspend.com/top-12-corporate-npas-cost-exchequer-twice-as-much-as-farm-loan-waivers/. Delhi: Farm loan waivers by state governments engender heated media debates and thus loom large in public consciousness, while use of government funds to infuse fresh equity into government-owned banks following large defaults by corporate borrowers goes nearly unnoticed. Total credit to industry was at Rs 26-27 lakh crore during each period, amounting to a share of 35% in overall bank credit. Within this, loans to large borrowers--who the RBI defines as receiving loans larger than Rs 5 crore--amounted to Rs 22 lakh crore each year. For the same period, the total credit to agricultural and allied activities was Rs 7.7 lakh crore--the entire agriculture sector owed the banking system the same amount borrowed by the top 10 Indian corporate borrowers. Among NPAs in the banking sector, the top 12 which make up approximately 25% of total NPAs were identified and referred to the National Company Law Tribunal (for resolution and recovery) by the RBI in 2017. Of these, four have been resolved within a year with about 52% of their dues recovered. This recovery represents only 14%, or Rs 48,300 crore, of the total Rs 345,000 crore owed from all 12 NPAs. Thus, about Rs 3 lakh crore remains outstanding from just eight corporate NPAs--nearly double the total farm loan waivers announced by the 10 states. The amount written off by banks for just five corporate NPAs is thus Rs 11,106 crore--more than the combined farm loan waivers in two states, Chhattisgarh and Andhra Pradesh. While popular opinion on farm loan waivers vilifies the poor and marginal farmer, small farmers benefit the least from agricultural credit since they borrow largely from informal sources such as moneylenders. Therefore, these farms do not benefit from loan waivers announced by governments that are not applicable to non-formal sources of credit. Agricultural credit in India is now mainly large-ticket (of larger loan amounts) and goes towards corporate activity in the farm sector, as data show. The share of high-value loans (above Rs 10 lakh) increased from 4.1% in 1990 to 23.8% in 2011 of all ‘direct’ agricultural credit, which goes directly to people/institutions directly involved in farming and allied activities (as opposed to, for instance, funding for further lending by cooperatives or to state electricity boards for provision of electricity to farmers). The share of small loans (Rs 2 lakh) decreased from 92.2% to 48% in the same time period. The RBI revealed that public sector banks (PSBs) had handed out Rs 58,561 crore to 615 accounts in agricultural loans in the year 2016, in response to a Right to Information application filed by The Wire. This averages out to more than Rs 95 crore in agricultural loans to each account. It is actually corporate borrowing that has spurred the growth of agricultural credit in India, thanks to the RBI mandate that 40% of banks’ lending (or ‘adjusted net bank credit’) must go to to priority sectors of the economy, with a sub-limit of 18% for agriculture. Strong growth in bank credit to industry and other segments of the economy has, as a by-product, led to the growth of agricultural credit. Not only is the growth of agricultural credit mainly in the big-ticket segment, two other things stand out: Most agricultural credit is disbursed just before the end of the financial year for banks to meet their priority-sector lending targets--and is as such off-season credit that does not really help farmers--and an increasing and large proportion of agricultural credit is disbursed via bank branches in urban India, according to a paper by R. Ramkumar and Pallavi Chavan published in the Review of Agrarian Studies in 2014. Agriculture-related disbursals for meeting targets, which largely go to corporate activity in the farm sector, do not help the real small farmer. The increasing and large percentage share of big-ticket loans in agriculture does suggest that the corporatised ‘farmer’ is enjoying the benefits of the way the regulator has incentivised the banking sector. On the other hand, the small and marginalised farmer now depends heavily on non-institutional and expensive forms of credit. 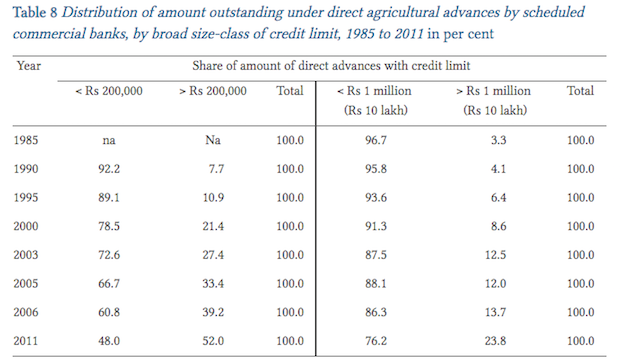 As the chart below shows, over-dependence on usurious finance for small/marginal farmers is reflected in the very low (14.9%) share of access to institutional credit of farmers with land holdings smaller than 0.01 hectare. A key underpinning of bankruptcy procedures is the limited liability clause that protects the assets of promoters unless explicitly pledged. Corporate bankruptcy, therefore, is a simultaneous process of cleansing bank balance sheets and a mechanism allowing optimal risk-taking by entrepreneurs. Entrepreneurs can come out of bankruptcies with their personal assets unscathed, whereas a farmer who loses a crop--due to unfavourable weather conditions or a price crash--can lose everything. A farm loan waiver is a sector-wide extinguishing of loans mandated by the government, usually after an election to fulfill a poll promise, with the exchequer compensating banks. Although corporate NPAs do not normally entail government obligation (unless NPAs originate in public sector banks or are due from public sector corporations), the exchequer gets involved when conditions warrant that the state must indirectly bear the burden of corporate NPAs by infusing funds into banks--as is happening now in India, and happened in the US following the 2008 financial crisis. Equivalence can also be drawn when the problem of corporate NPAs repeats itself in the same sectors, implying that banks keep lending to the same sectors even in the absence of structural improvements. Cases in point are persistent problems in the power and infrastructure sectors. We looked at RBI data on segment-wise performance of exposures of banks to address this question. We analyse two time periods: The position as of March 31, 2001 and then the position between the period March 2009 and March 2013. Contributions to total gross NPAs of the banking sector by large industries, medium industries and agriculture as of March 2001 were 21%, 15.8% and 13.3%, respectively. Of the top 10 borrowers in the Indian banking system, even if one excludes Reliance ADAG and Videocon (the latter does have substantial interests in infrastructure and mining), all others have businesses primarily in pure infrastructure and heavy industries. Next, for industries (overall) and agriculture, we consider the movement in percentage of total impaired asset ratios between 2009 and 2013. Around 10.2% of all loans to industries were impaired in March 2009 and this increased by 5.8 percentage points to 16% by March 2013 (and the position has only worsened after 2013 as shown by the table). For agriculture, 5.4% of exposure of the banking sector was impaired as of March 2009 and this worsened by 2.8 percentage points to 8.2% in March 2013. As is evident from the data, the percentage of impaired assets in agriculture has been far lower than that in industry. The then RBI Governor, YV Reddy, in a speech delivered at the National Institute of Bank Management, Pune, on January 6, 2004, had acknowledged that banks followed a sort of rule in lending: Small industry loans at 11%, agricultural loans at 10% and industry loans at 7%. This means that the credit quality (the principal criteria for judging a company’s creditworthiness or risk of default) of large corporate borrowers is not superior to that of agriculture/priority sector lending. Interest rates charged by banks from large corporate borrowers are therefore incommensurate with the risks involved. Policy has focused on keeping food prices low for consumers through restrictions on farmers and subsidies to consumers. The average yearly revenue lost by Indian farmers between 2014 and 2016 on account of export restrictions, after deducting the subsidies they received, was Rs 1.65 lakh crore, as per the Organization for Economic Co-operation and Development. This model of development is no longer tenable, many experts and policy-makers concur. First, India can no longer rely only on exports and must ramp up domestic demand to power its growth. And skewing income distribution away from a sector which employs 42% of India’s workforce will not help. Second, cities are unable to manage the influx of refugees from agriculture, so farms have to be made more productive and remunerative. Third, the Swaminathan/National Commission on Farmers report of 2006 clearly states that India’s food security cannot be achieved through imports, thus emphasizing the imperative of a healthy agricultural sector. Finally, from an ethical point of view, taking care of the big farmer who, unlike the corporate promoter, risks losing personal assets in the event of a default, is as important as taking care of the big businessperson. In sum, structural problems in both the agricultural and corporate sector must be addressed with equal urgency. Empathising with the corporate sector for its woes while deriding the farm sector for its alleged profligacy is a recipe for pitting town versus country in a battle that no one can win. Industrialists are historically known to be dishonest. Before industrialisation, self-employment was the only source of earnings. Industrialisation created formal jobs. Left movements, through reforms, fueled aspiration for formal sector jobs. Demand for jobs motivated governments to offer sops for more industrialisation, which is God’s gift to crony capitalists. Ireland is known as the start-up hub of the world & its progress is noteworthy. We must do away from the objective of creating jobs in the formal sector and promote self-employment.